Black Magic, Angels, and Miracles on the Camino Black Magic- on a Friday, late afternoon – bad luck we ran into last week when we followed the advice in our guidebook and took the bus from Mansilla to Leon in order to bypass the heavy traffic coming into Leon, a large city here in the north of Spain. Michael in a moment of haste, left his “murse” (man’s purse) on the bus. He didn’t realize it until we were halfway to our albergue so we had to make the decision: return to the bus which most likely would already have left the station, or check into the albergue and ask for some help there. We decided on the albergue option. 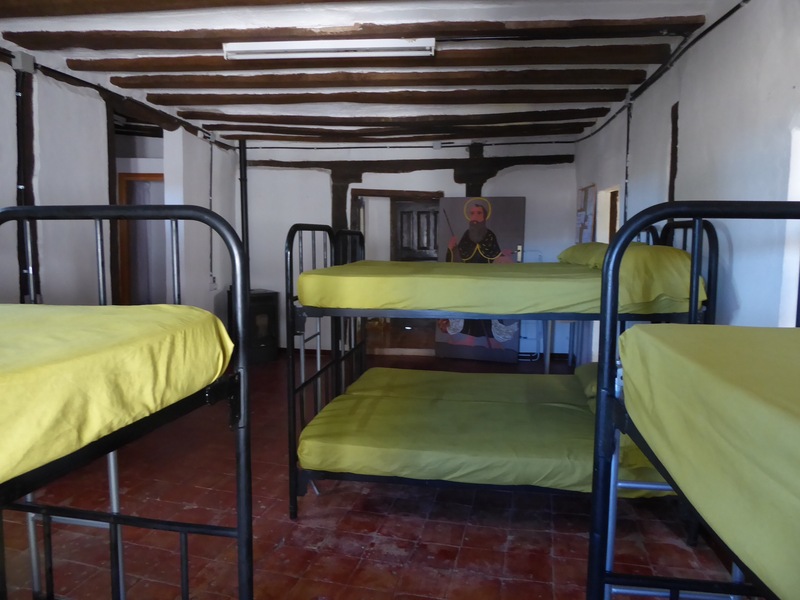 There, we met our first angels, Christina, Paul, & Jose, the hospitaleros at the albergue S.Maria de Carbajal, a convent in the old city. 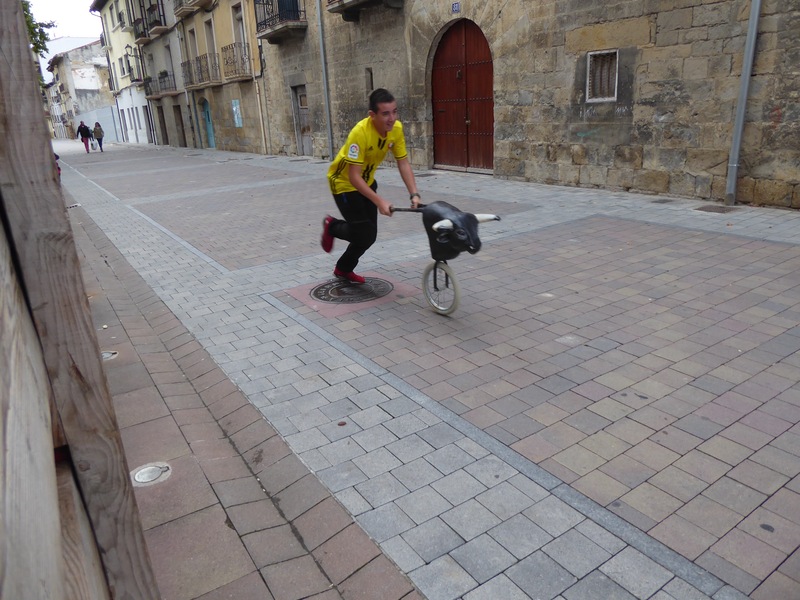 As soon as we explained what had happened, Jose was on the phone to the police in both Mansilla and in Leon. They recommended we take a taxi and return to the Mansilla bus station, so that’s what we did. 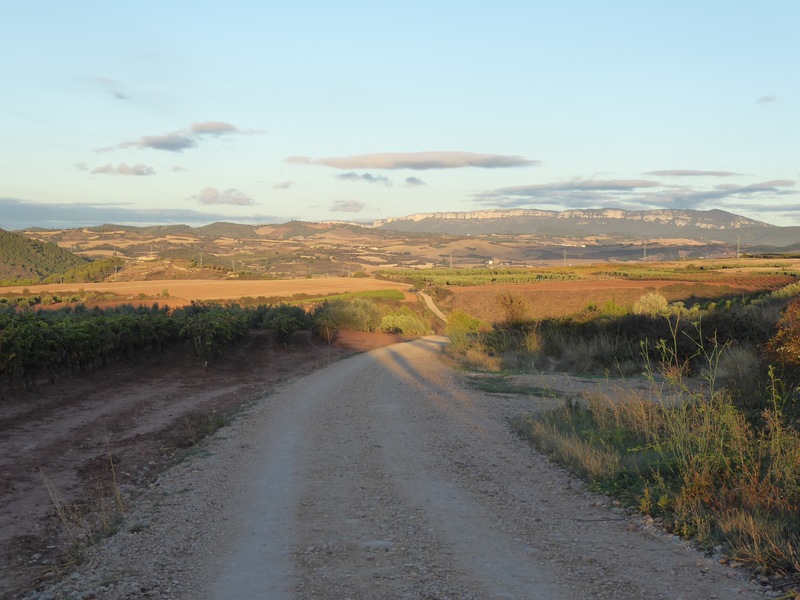 No sooner had we started back in a taxi, than Paul called to say that the Guardia Civil had gone to the station to check and that it wasn’t there and that we should return to the Leon National Police to fill out a police report which we did. Not a word of English was spoken by anyone at the police station. The report we filled out was in both Spanish and English. Finished! We were sent on our way. The police couldn’t even send us in the right direction. It was as we stood on a street corner looking at our map, trying to figure out how to get back to the albergue, that another angel popped up. He led us all the way to our abergue!!! (Meeting again two days later …he asked if we’d found the bag and when we answered NO, he said we should just stay in Leon!) We checked into the albergue and immediately Michael got on the phone and cancelled all of his credit cards. Thankfully, all of mine would still work. Thankfully also, Michael had his wallet and cash in his pocket. The passport and iPad were the issue. We could deal with a missing iPad but….the passport would be a very big issue … we would have to go to Madrid, to the US embassy there to apply for a new one AND that would take three weeks. The bad luck wasn’t quite over. That night, unbeknownst to me because of my super duper Walmart silicone earplugs until 2 am, Michael was ferociously sick, vomiting violently all night long. I think the last episode being around 0530. I had no idea what caused it because we had eaten exactly the same thing and I was fine. Our three angels at the albergue insisted we stay another night and let Mike sleep most of the day.. they would clean and organize around him as he slept. I, on the other hand, had to leave. 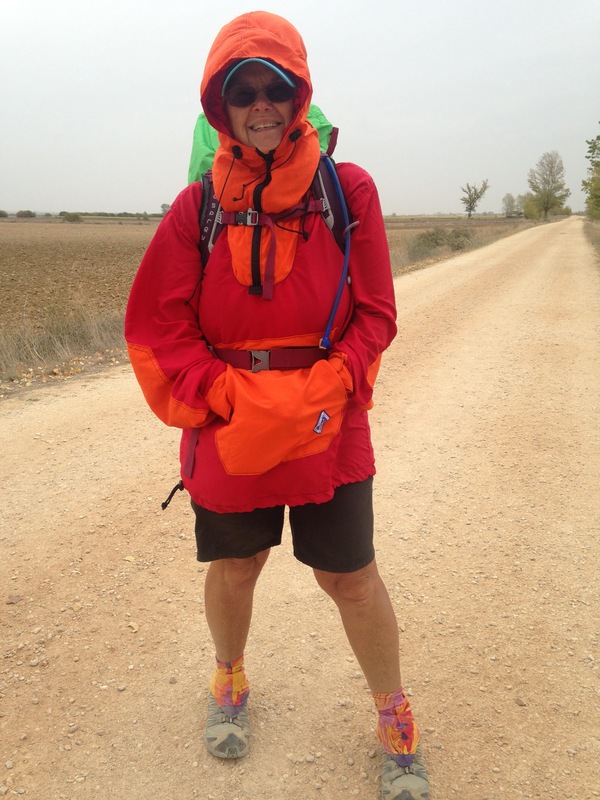 Off I went, not dressed for the cold – armed with map and guide book. Within minutes I was totally lost without my trusty navigator (Michael). 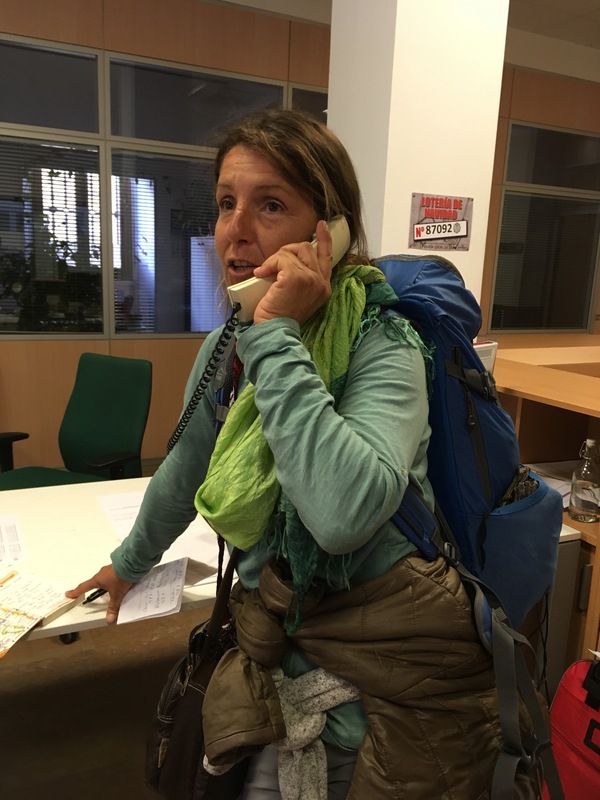 Seeing a woman walking by carrying a pack, I asked her if she was a “peregrino.” Indeed she was; Alicia arrived the night before from Menorca and spoke fluent English and Spanish. She became the next angel. She was headed for the cathedral and invited me to join. The cathedral was closed so she bought me a coffee and we sat in the freezing cold outside so she could have a smoke. She kept covering me up with her sweater. We went to the cathedral when it opened at 9am followed by another site, San Isadora, where I believe the Holy Grail is kept, but after that, she spent the rest of her time helping me by walking to the bus station, calling numbers for the bus line, the police (both in Mansilla and Leon), the Police lost and found ….. and so much more….she did so much for me. 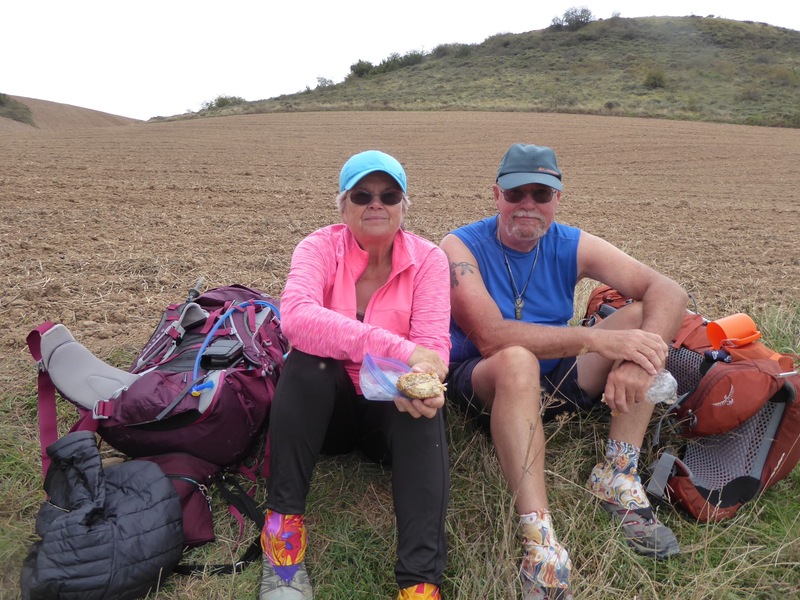 Finally, I bought her a smoothie before she had to catch her bus to Villafranca to start her Camino there, and returned to see how Michael was doing. He was weak but, much better than before. Leaving Leon the next day, Sunday, Michael wasn’t able to go much farther than 8km. We got a private room in a Hostal. Mike still wasn’t eating much and I wasn’t too hungry either, having caught another version of my cold and maybe a bit of Mike’s flu bug. The next morning we tried to call the embassy to talk to a human….no luck there – only got the message telling us to write an email. USELESS! That was Monday morning. We made the decision to walk on for two days, allowing time for the bag to be turned in. It had disappeared on the weekend when everything was closed…. maybe it still would be accounted for. With nothing else to do so we walked on, admittedly feeling despondent & considering throwing in the towel on this experience. We walked and as we walked we started to feel better. 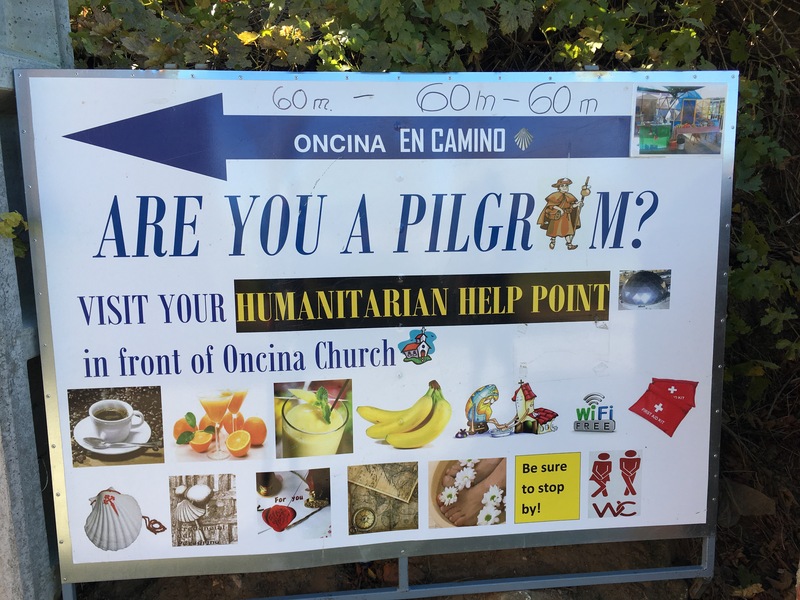 We saw a sign asking, “Are you a pilgrim?” It was a rest area off the beaten path. Michael wanted to stop and I wanted to take pics of the stork’s nest on the church. What a delight. Fresh squeezed orange juice, chocolate, fresh fruit….lots of stuff all by donation. There we met are biggest angel of all, Manuel who ran the place, and Barbara, an angel who helped translate to Manuel what had happened. Manuel called all of the numbers that angel Alicia had written down for me, without luck. But, he wanted to know where we would stay that night, just in case something turned up; as he promised to ‘try’ again later. 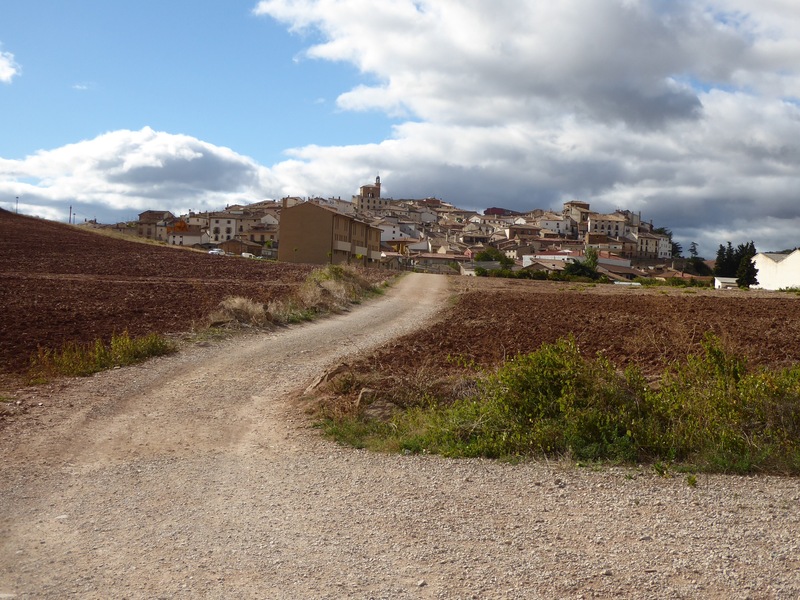 Although we had planned to stay at Villavente; we ended up staying only a short distance further at Villar de Mazariffe. We went for a snooze and at 645pm were woken by a knock on the door to tell us that there was a man waiting to see us. Mike went up first. By the time I got there, I saw Manuel from the rest stop in Oncina, giving Mike his bag, with all the contents intac. From what we could understand of the situation, the bus driver had found the bag, contacted the Leon police who contacted Manuel. 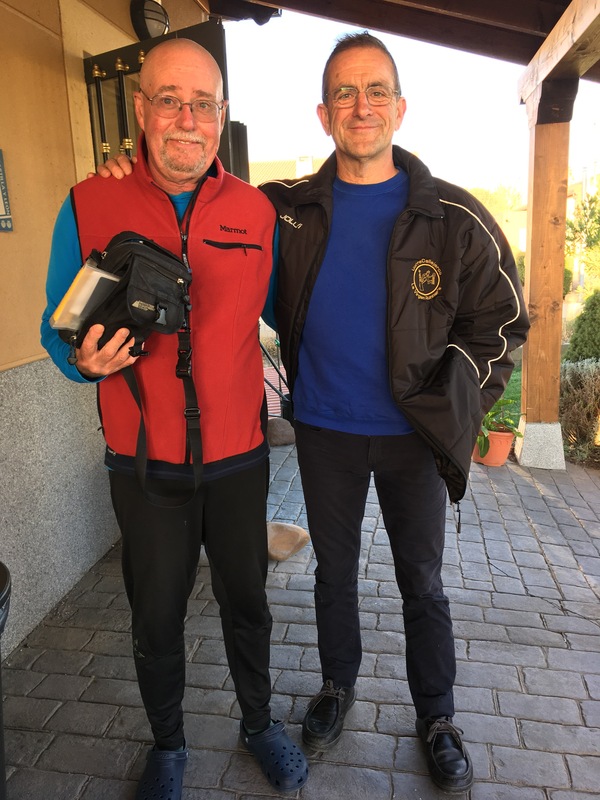 Tears began to flow as we learned that Manuel had driven his motorcycle all the way to Leon to pick up Mike’s bag….drove to the village where he thought we might be staying….Not finding us there, he stopped at every albergue on the way back until he found us!!! I still cry to think of his great kindness…without any expectation of reward….just for the sake of helping and giving. We bought him a beer and then we met our next angels, Renata and Sylvia from Brazil. We wanted to know the details of what had happened and asked them if they could translate. So we told the story in English to Renata, who translated it in Portuguese to her sister Sylvia, who in turn translated it into Spanish For Manuel and that’s how we found out all the details. 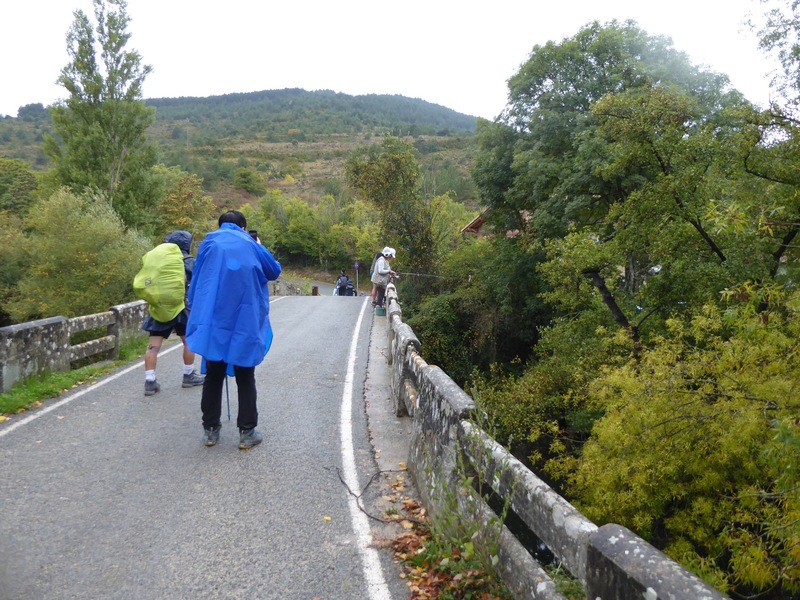 And that’s the Miracle of the Camino for us. In good weather, layers are the best. Sleeveless first, then short-sleeved, followed by long sleeves. Strip as needed. 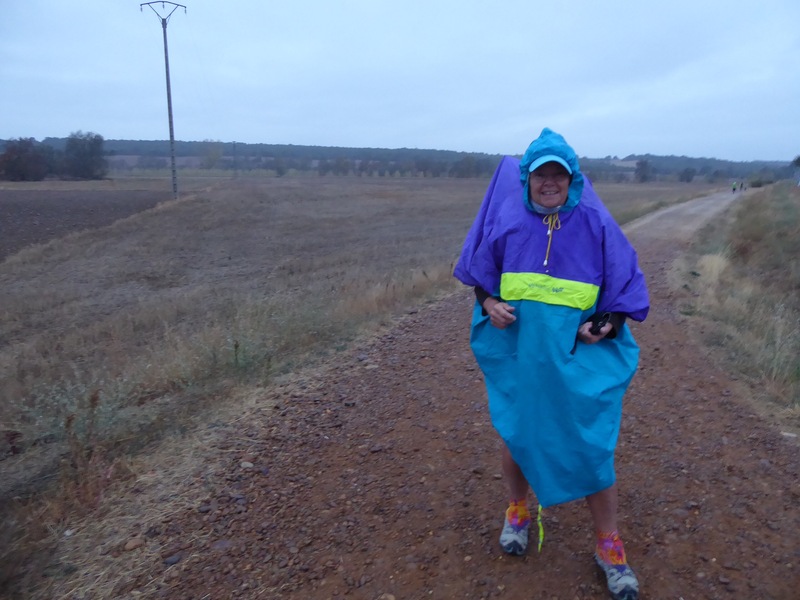 For cool windy days or for light rain, this wind jacket we bought last minute in Laramie WY has been a godsend! When it rains steadily a poncho which covers everything, works the best. Shorts are best because bare legs dry much faster than leggings. And when the rain stops, all you do is flip the front of the poncho back over your head where it can dry somewhat and allow you to cool off. That poncho kept me cozy and warm today for the first half of the day. The cap is a MUST as it keeps the raindrops off my glasses. The “mussar ” (scarf), my favourite from Oman, is also a MUST as it keeps your neck warm, soaks up sweat, dries quickly, and works as a blanket in the plane too. The little orange “baby wash-cloth” (thank-you Leah) is my “snot rag”. There’s already way too much tissue deposited all along The Way! Today is Day 21. 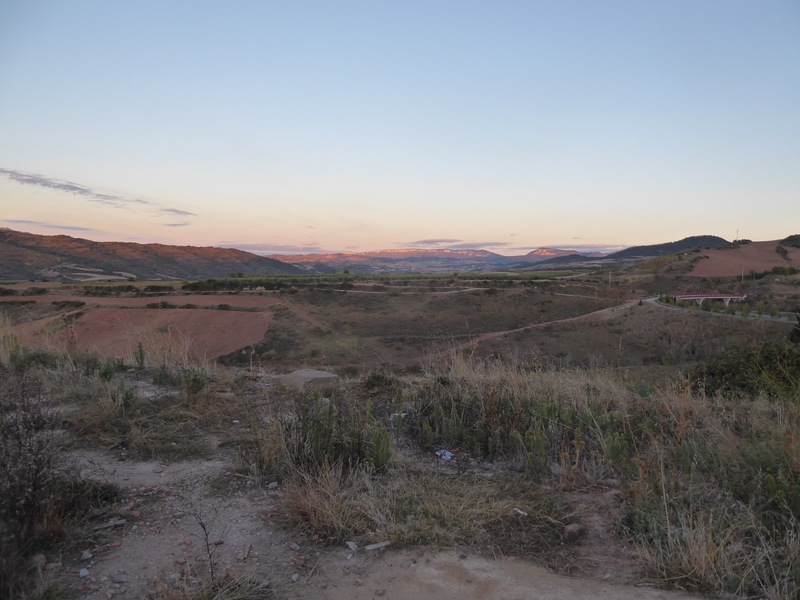 We are at the halfway point in Sahagun, just a few days before we get to Leon. We have had only one rainy day before today, earlier on in the walk. 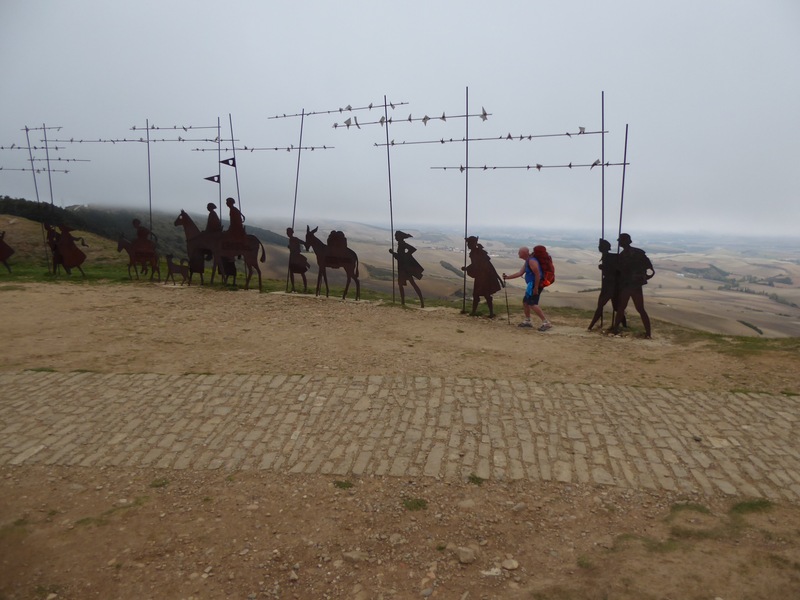 The MAGIC abounds on the Camino but that’s a whole other blog!! 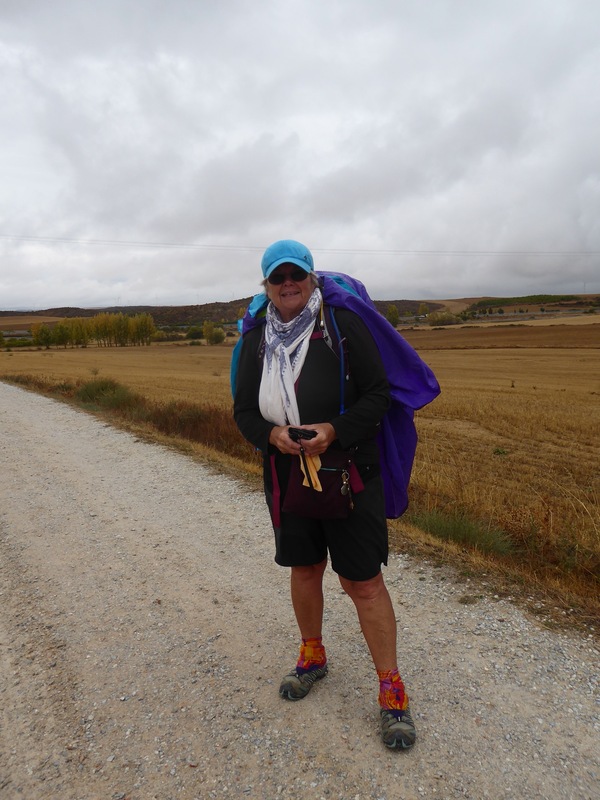 6 Days of walking, 115 km plus or minus a few, approximately 20 km/day. Here is a photo gallery of the best these 6 days had to offer. 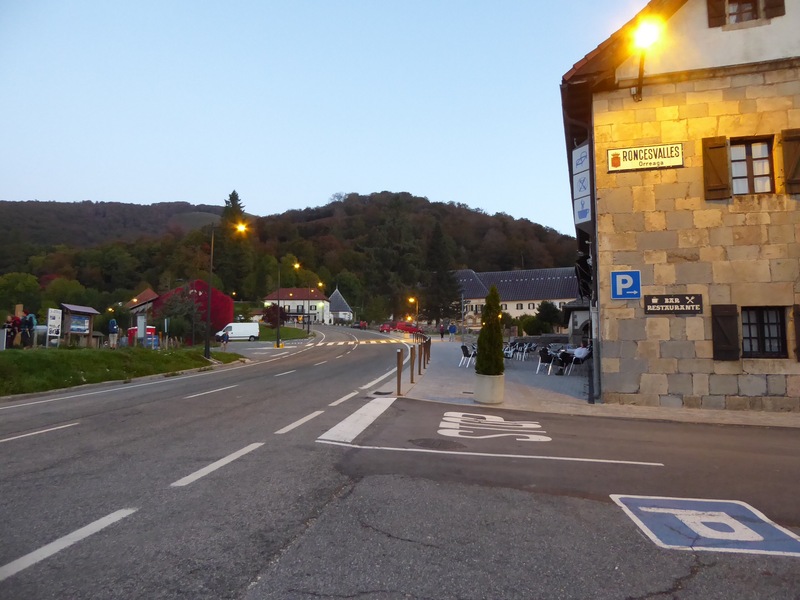 Leaving Roncesvalles after breakfast just as the sun was rising. 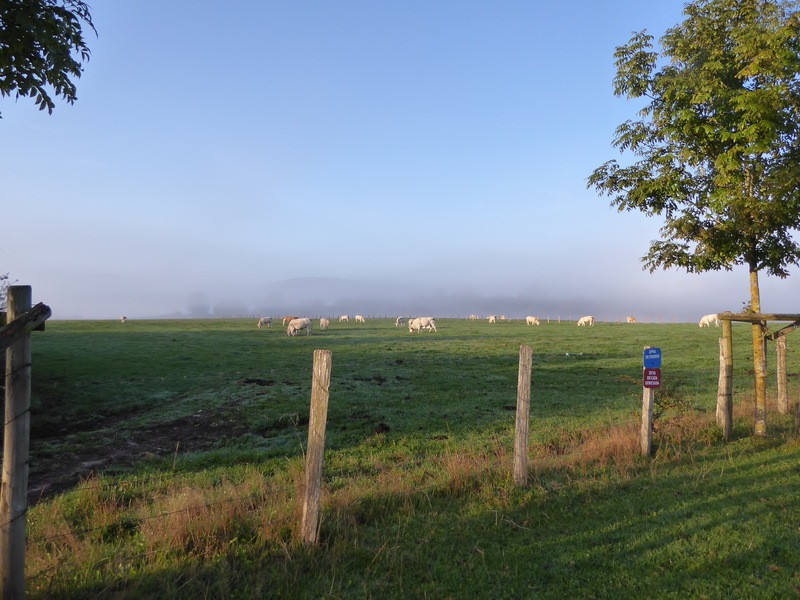 Cows in the mists of early morning. Day 3 was a rainy day. We experienced a lot of “slippery slopes” and heard later that some poor soul had broken an ankle on said slippery slope. Always pretending but actually this time Michael was suffering from a sore knee. I love cats. Michael doesn’t. 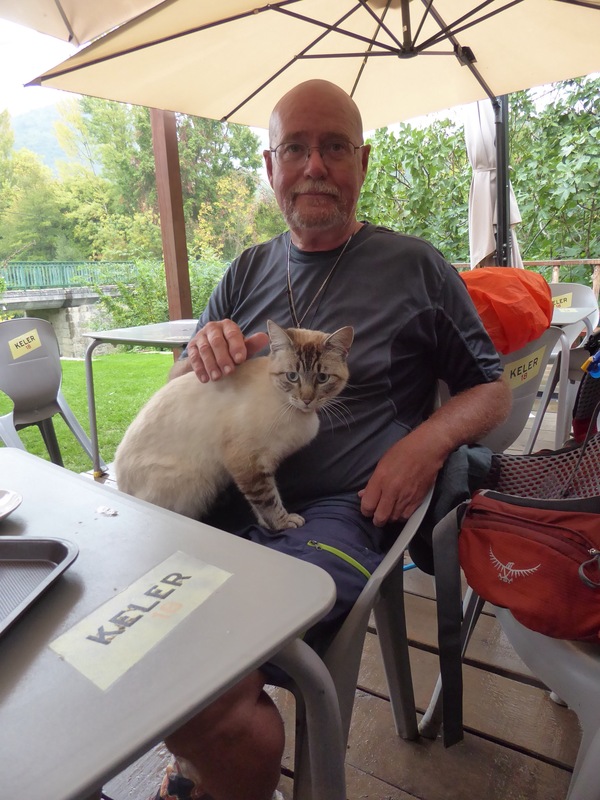 When we stopped for coffee and to get out of the rain for a while, this cat popped up onto Michael’s lap looking for a handout. 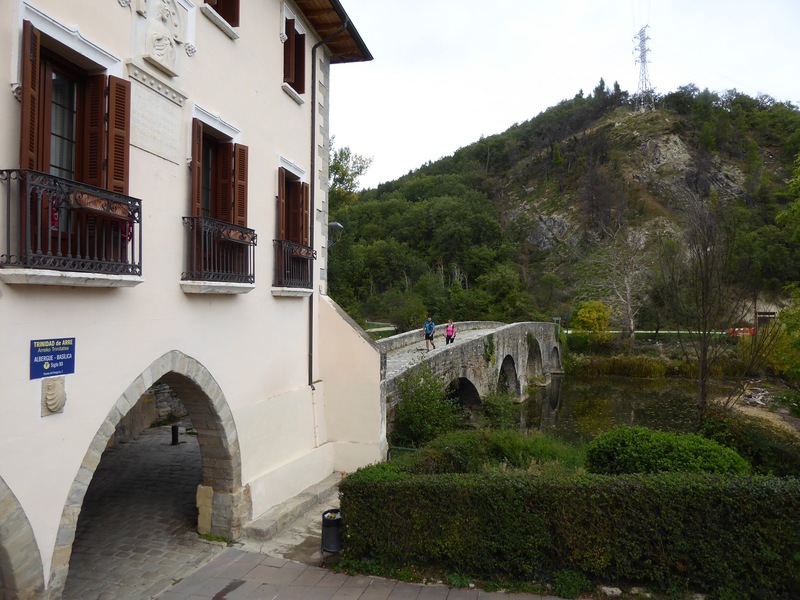 The bridge into Trinidad de Arre. We saw a 12th or 13th century convent/church and decided to stay there. Asked if they had a private room – they did. It was a beautiful building and we made some new friends who informed us that there was to be a fiesta that evening and bulls running in the street the next day. Sure enough, there was a fiest that night with fireworks, music, food, and carnival rides. Before that though, we encountered this young man chasing an excited, screaming group of kids with his bull on wheels. Nearing Pamplona we walked around the walls of the old city. 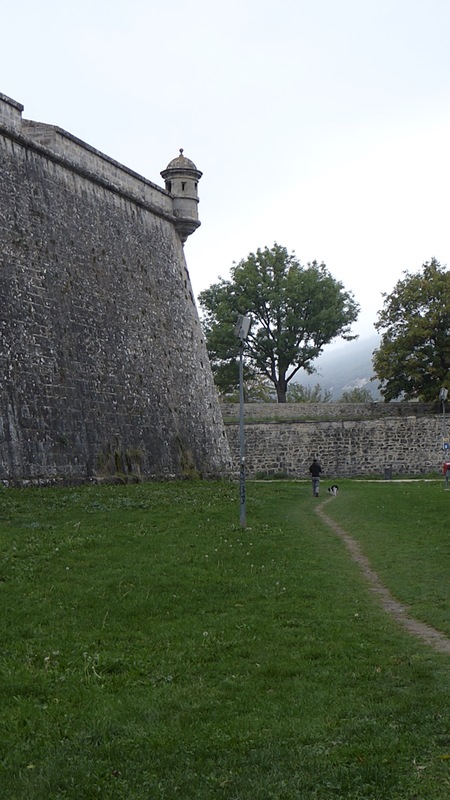 ….and through the gate into the city to search for a coffee. 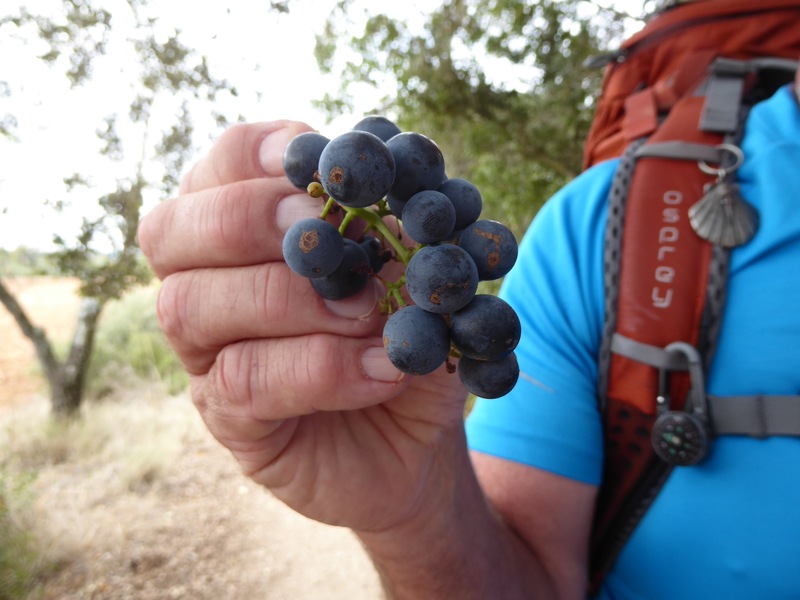 Our first taste of grapes – the harvest all around us. At the top of the pass at Alto del Perdon. Spectacular! Cerauqui where we stayed the night at the top of the hill! The sun rising and illuminating the hills in the direction we were walking. Such beautiful countryside. Constantly new vistas. Dreams & fires are alike ….some are extinguished … some burn out… others die out, smolder… then some new fuel and a breath of air and they reignite. 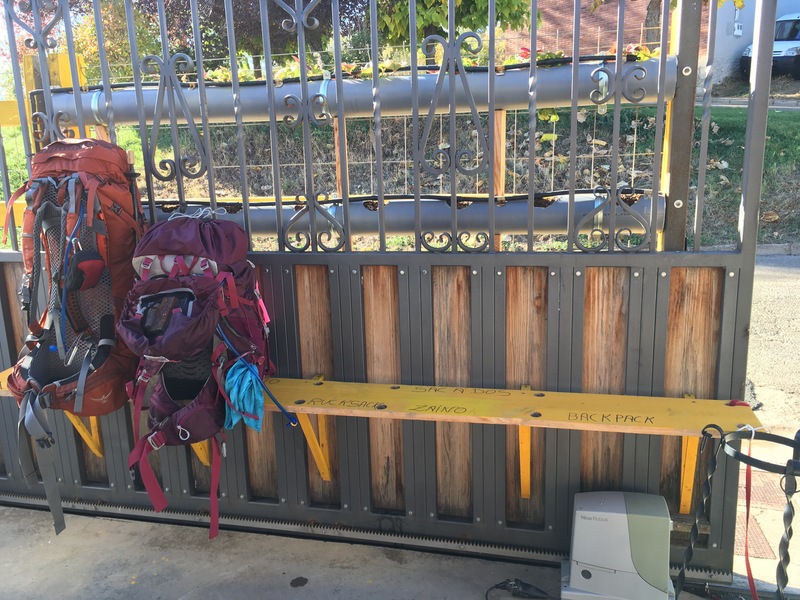 It’s been almost 2 years since our ‘shakedown’ walk in Switzerland on the Jakobsweg… 100km in a week. 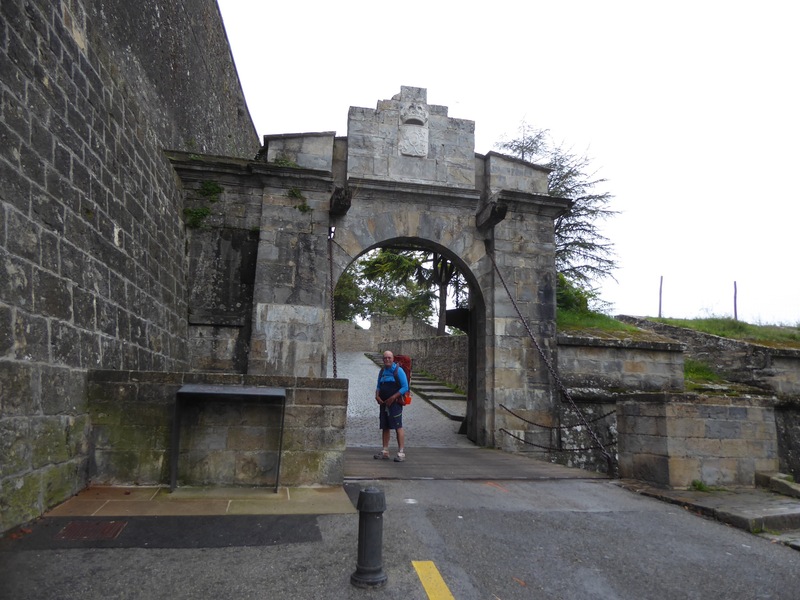 A test of our desire to walk the Camino de Santiago (Way of St James). 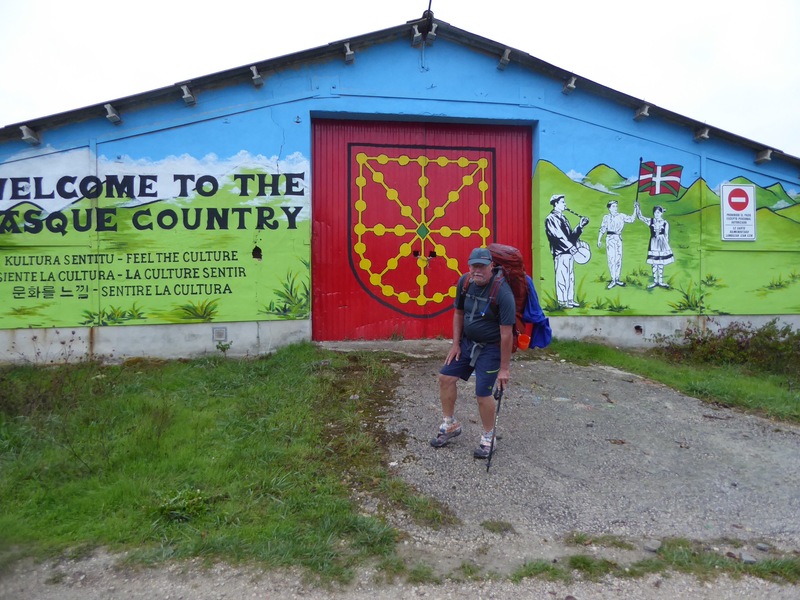 We discovered that not only was walking the best way to see and experience the countryside and people but, we really enjoyed the challenge of carrying all our necessities on our backs 20+ km each day to stop at a hostel populated with others with similar intentions.m shakedown . And so, OUR dream/plan became – work one more year save [Our lives are bound by one financial stricture – absolutely NO DEBT. 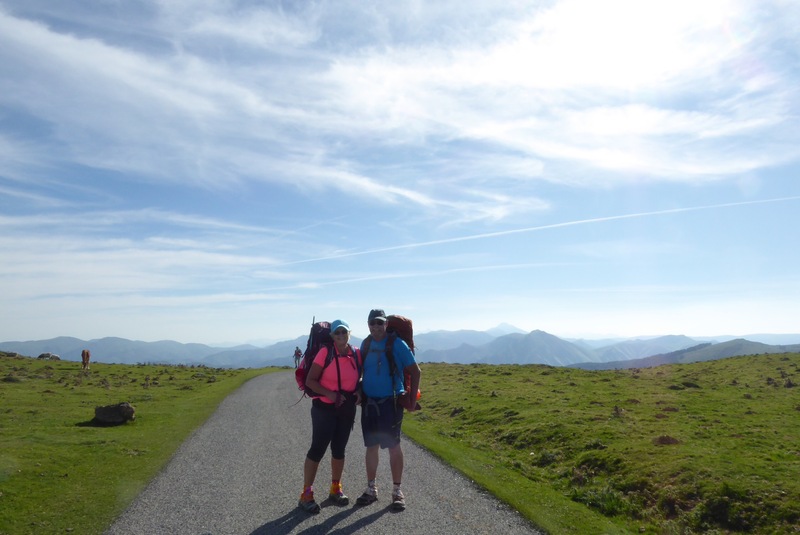 Saving up rather than ‘borrowing’ is our mode…] and prepare for the three month walk from where we left off in Switzerland through France and Spain to the Compostela de Santiago in Spain, a 2300+ km journey. BUT, when in early 2016 we had to commit to another year teaching at a dysfunctional school, the stress on our physical & mental health was a price higher than we were willing to pay. We retired from teaching and returned home. We thought the dream extinguished,… but, it was merely smoldering until a breath of air and some added fuel changed everything. 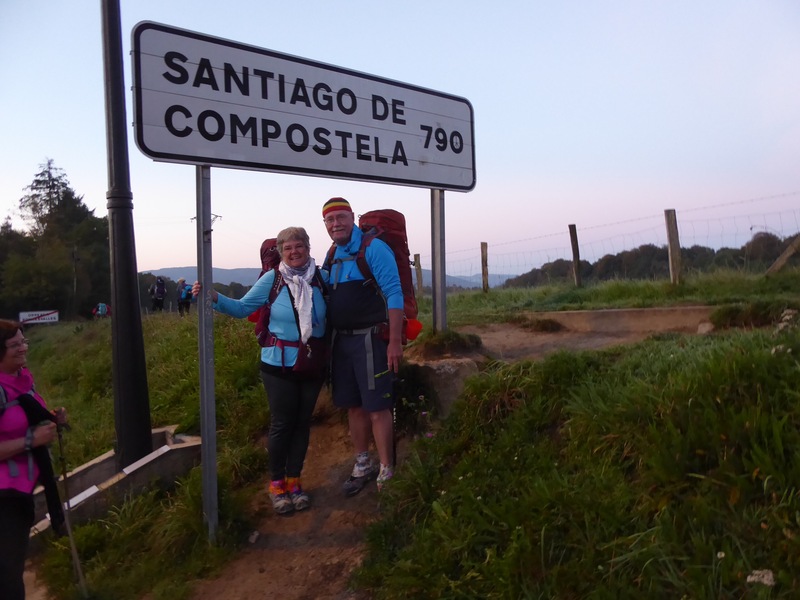 For Tilly and I the ‘air’ was the question ‘if you had only 30 days to live… what would you do?’ Both of us immediately thought of the Camino journey we had abandoned. Our fuel was the follow-up “ IF those things are so important WHY NOT do them NOW?” The fire was re-kindled. Our first question wasn’t “Can we afford it?” but rather “What do we do to make it happen?” I jumped into “RESEARCH” mode… within a day I had a spread sheet detailing the daily expenses, travel costs and associated costs (storage for our 5W and truck). We could consider 30 days, 45 days & even up to 60 days. But the three month journey that would take up where we left off in Switzerland would have to wait until we added a few more $ to the travel fund. When your plans don’t fit your circumstances THEN it is time to take the hint and alter the plans. If we started in France, we had the perfect window of opportunity … Late Sept – October and November …60 or so days. We could use our accumulated air miles to lessen the cost – although in the end it only saved us 20% or so as we jumped through hoops & miscellaneous expenses of transferring and purchasing the extra air miles to make it all work. Having used all our air miles; next time I will just hunt the cheapest flights online… less work and certainly less aggravation. So 10 days after the decision to go… only first nights hotel and the flights are booked. If it had not been so prohibitive cost wise I would not have booked a return fight home…. then we would have had no deadline. So I booked our return from Paris 67 days after our arrival… almost twice the time most folks take to complete the journey… alleviating the ‘deadline factor’. Once we arrive in Paris – we can be like the pilgrims of old …take it one day at a time… accepting what comes.